Whole Grains every day? Eating whole grains every day has been shown to reduce stroke risk by 30-36%, type 2 diabetes risk by 21-30%, heart disease risk by 25-28%, and aid in better weight maintenance. Don’t know how to cook whole grains? 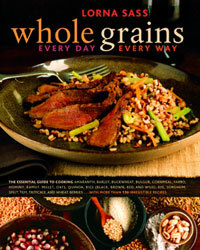 Don’t worry it’s so easy with Lorna’s new book, Whole Grains Every Day Every Way , that uses a wide range of fresh, diverse produce and products are easy to find in grocery stores or order on-line. Lorna Sass, author of Cooking Under Pressure and many other reknowned health publications, has written an exciting book on grains that will appeal to anyone, meat-eating, vegetarian, vegan. Ideal for the home cook who wants to learn more about whole grains, its easy, time-saving recipes will become a valued resource in your kitchen. Congratulations to my good friend and colleague Lorna Sass on winning the prestigious James Beard Award in the healthy focus category. Jenn: congratulations on your gorgeous and very informative website! I enjoyed and benefitted from every minute of visiting with you. Thanks Lorna! And congrats to you on the James Bread Award, great to hear they recognize such knowledgeable food experts!